One of the things that we can expect from a Supreme Court that is stacked in favor of conservatives is that we could see an erosion of federal protections for women, people of color and LGBT Americans. In many instances, decisions on these critical issues could be sent back to the states. That is yet another reason why the upcoming midterm elections, including those that will determine governorships and the make-up of state legislatures, are so important. In addition, the governors elected in November will preside over the redistricting process that will take place after the 2020 census, affecting the make-up of both congress and state legislatures over the next decade. So a lot is on the line. Democrats are within five seats of reclaiming control of state Senates in Arizona, Colorado, Florida, Maine, New Hampshire, New York and Wisconsin. The party is only a handful of seats away from winning control of lower chambers in Michigan and New Hampshire, too. Cook Political Report lists the toss-up races as follows: Florida, Georgia, Iowa, Kansas, Maine, Nevada, Ohio, South Dakota and Wisconsin. The good news from that list is that flipping New Mexico and Michigan from red to blue is already likely. 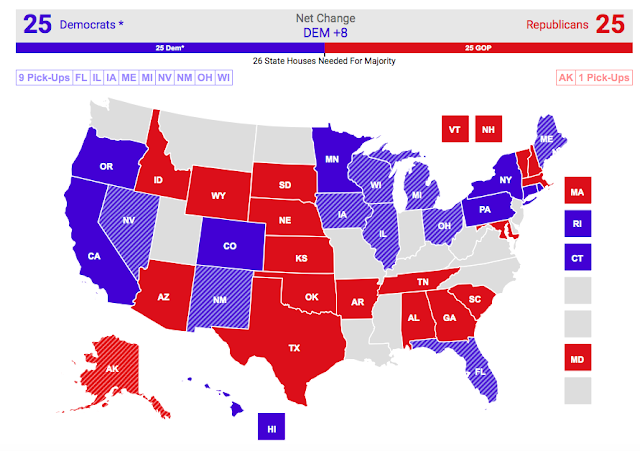 Unlike the House and Senate, there is no point it tracking which party wins a majority of governors races. But based on the current make-up of state legislatures, having a governor who provides a check on Republican initiatives could be critical in the following states where the race is a toss-up: Florida, Georgia, Iowa, Kansas, Ohio, South Dakota and Wisconsin. That gives you a list of seven key governors races to keep an eye on between now and November 8th. On Tuesday I identified the seven key senate races to watch: Arizona, Florida, Missouri, Nevada, North Dakota, Tennessee, and Texas. More recent polling suggests that the races in North Dakota and Tennessee could be moving out of reach for Democrats, which whittles that list down to five.